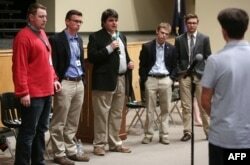 Kansas candidates, from left, Ethan Randleas, 17, Lt. Governor candidate Alexander Cline, 17, Jack Bergeson, 16, (and Cline's running mate), Tyler Ruzich, 17, and Dominic Scavuzzo, 17, speak at a forum in Lawrence, Kansas, Oct. 19, 2017. Randleas, Bergeson, Ruzich and Scavuzzo are running for governor of the state, which has no age restrictions for gubernatorial candidates. The American state of Kansas does not make it very easy for its citizens to vote. A person must show proof of American citizenship when registering to vote in an election. Once at the polling place, they must show photo identification. The United States Commission on Civil Rights says Kansas has among the strictest voter identification laws of any state in the country. Yet, Kansas has no real laws about who can run for state office. There is nothing, then, to stop high school students -- and even a dog -- from seeking to become the next governor of the state. Jack Bergeson is a 17-year-old high school student in Wichita. He is also a candidate for Kansas governor. He hopes to become the state’s Democratic Party nominee for the election in November. However, he calls himself an “anti-establishment” choice. On his official website, Bergeson writes, "I may be too young to vote, but I am not too young to see the problems in Kansas that the government should be, but is not, working to fix." Kansas’ former governor, Sam Brownback, is a member of the Republican Party. He was elected as leader of Kansas in 2011. Last month, he left office to begin his appointment as U.S. Ambassador-at-Large for International Religious Freedom. Bergeson announced he was running for office last August, when he was still 16. Three other high school boys announced soon after that they too would run for governor. They are Republicans. Last October, the four young candidates gathered for a debate at a high school in the city of Lawrence. They discussed their positions on abortion, taxes, environmental policies and other issues. Randleas, Bergeson, Ruzich and Scavuzzo are running for governor of the state of Kansas, which has no age restrictions for gubernatorial candidates. As of now, there are six teenage boys in the 2018 race for Kansas's governor. And last week, a dog tried to join them. As the Associated Press reported, Kansan Terran Woolley completed paperwork to enter his three-year-old dog, Angus, in the race for governor. Woolley decided to do so after hearing about the teenage candidates. But the Kansas Secretary of State’s office quickly announced it would not permit Angus to run for governor. Kansas politicians are now trying to pass a bill to establish minimum requirements for candidates to run for office. The bill would bar people under the age of 18 from running for governor, secretary of state or other top offices. It would also require candidates to have lived in Kansas for at least four years. Many states already have at least some minimum qualifications for people seeking office. In Virginia, for example, a person must have lived in the state for the full year leading up to the election. They must also be qualified to vote -- and voting age in the United States is 18 and up. California requires that candidates be registered to vote and not have a criminal record. State rules are often stricter for those running for top offices such as governor. New York, for example, requires all candidates for governor to be at least 30 years of age. They must also have lived in the state for five years immediately before the election. The proposed Kansas bill would not affect Bergeson and the other teenage candidates. If it becomes a law, it would only take effect after the November election. Although the proposed bill does not affect his candidacy, Bergeson is still against it. Ashley Thompson wrote this story based on reports by the Associated Press, NPR, the Kansas City Star, Wichita Eagle and other sources. Caty Weaver was the editor.